The impact of a cosmic object may have played an important role in the demise of horses and other large mammals living in North America around 12,800 years ago, fresh research suggests. A long list of large mammals followed the path to extinction around that time, including the mastodon, mammoth and saber-toothed tiger. It was also the time when the Clovis people disappeared in North America. No one knows for certain why these people and iconic creatures disappeared, but the discovery of widespread platinum at archaeological sites across the United States by three University of South Carolina archaeologists has provided an important clue in solving this enduring mystery. Their findings are outlined in a new study published in Scientific Reports, a publication of Nature. The study, authored by 10 researchers, builds on similar findings of platinum – an element associated with cosmic objects such as asteroids or comets – found by Harvard University researchers in an ice-core from Greenland in 2013. The South Carolina researchers found an abundance of platinum in soil layers that coincided with the Younger Dryas, a climatic period of extreme cooling that began around 12,800 years ago and lasted about 1400 years. While the brief return to ice-age conditions during the Younger Dryas has been well-documented by scientists, the reasons for it and the demise of the Clovis people and animals have remained unclear. “Platinum is very rare in the Earth’s crust, but it is common in asteroids and comets,” says Christopher Moore, the study’s lead author. 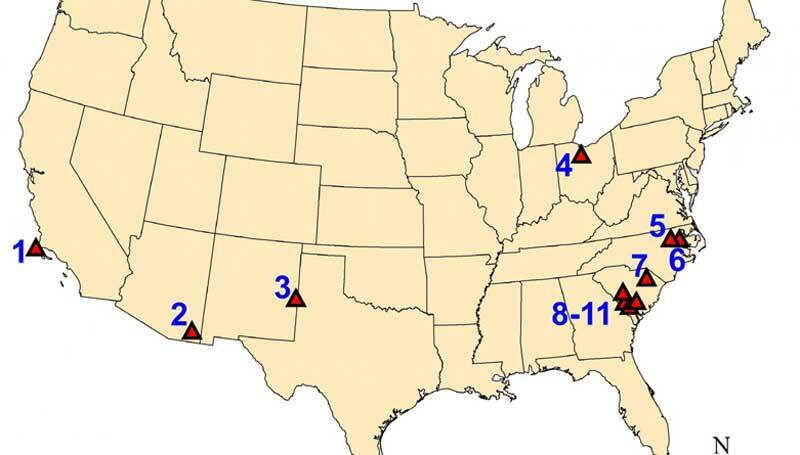 He calls the presence of platinum found in the soil layers at 11 archaeological sites in California, Arizona, New Mexico, Ohio, Virginia, North Carolina and South Carolina an anomaly. “The presence of elevated platinum in archaeological sites is a confirmation of data previously reported for the Younger Dryas onset several years ago in a Greenland ice-core. The authors for that study concluded that the most likely source of such platinum enrichment was from the impact of an extraterrestrial object,” Moore says. He says the Younger Dryas coincides with the end of Clovis culture and the extinction of more than 35 species of Ice Age animals. Moore says while evidence has shown that some of the animals were on the decline before the Younger Dryas event, virtually none are found after it. “In both cases, the anomalies represent the atmospheric fallout of rare elements resulting from an extraterrestrial impact,” Moore says. Moore says while his team’s data does not contradict the Young Dryas impact hypothesis, it also does not explain the likely effects that such an impact could have had on the environment, Paleoindians or Ice Age animals. Contributing to the study is Moore’s university colleagues Mark Brooks, a geo-archaeologist who conducts research and excavations at the Savannah River Site, and archaeologist Albert Goodyear, who has spent decades documenting Clovis culture at the famed Topper site. Topper, located in Allendale County, South Carolina, along the banks of the Savannah River, is considered one of the most pristine US sites for research on Clovis people. Goodyear’s work with Moore builds on research in which he found traces of extraterrestrial elements, including iridium, at the Younger Dryas layer at Topper that was published in the Proceedings of the National Academy of Sciences in 2012. Moore, Goodyear and Brooks conduct research through the South Carolina Institute of Anthropology and Archaeology in the university’s College of Arts and Sciences. In addition to Topper, the remaining 10 archaeological sites that Moore, Goodyear and others on their team conducted research on in 2016 included Arlington Canyon on Santa Rosa Island, California; Murray Springs, Arizona; Blackwater Draw, New Mexico; Sheriden Cave, Ohio; Squires Ridge and Barber Creek, North Carolina; and Kolb, Flamingo Bay, John Bay and Pen Point, South Carolina. Moore says the bottom line of the study and paper in Scientific Reports is the presence of an easily identifiable hemispheric marker (platinum) in sediment layers for the start of the Younger Dryas. That discovery contributes to the body of evidence that a potential cosmic impact event occurred and warrants further scientific investigation.